Green curry (gaeng kiao waan) is probably my favorite Thai dish of all time. Prior to moving to Thailand I stuck to some pretty simple dishes. I didn’t venture into anything exotic and at the time the idea of eating a big bowl of what looked like split pea soup did not appeal to me. So, upon moving to Thailand I had never tried it. Thankfully, when you live in Thailand and are working very hard to follow traditional customs (and not offend people in the process) you eat whatever is put in front of you. 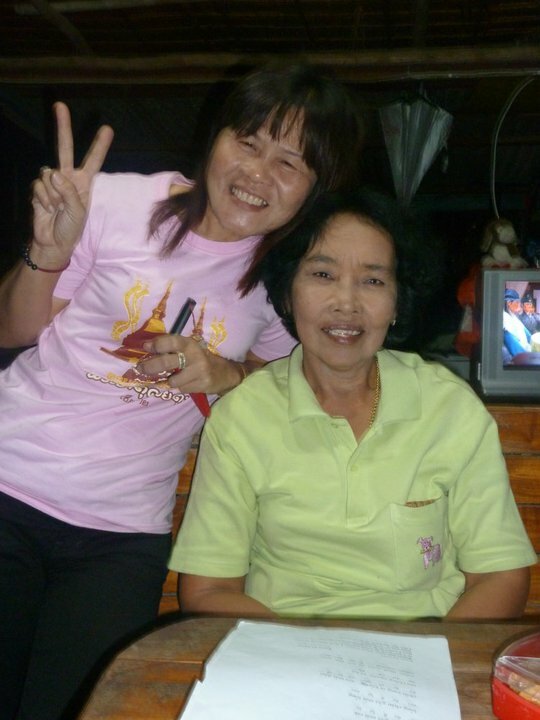 My mae and neighbor, Pii Mem, during my stay in Thailand. Kitung mak mak. During my first few days with my host family in Ayutthaya I was presented with a large bowl of green curry at breakfast. Fantastic. I’d only been there a few days and I was already being tested. Maybe I can just avoid it and eat everything else. I quickly dished myself some rice and a portion of the kai diao (fried egg omelet) consciously steering clear of the green goop. My mae (mother) noticed the absence of curry on my plate almost immediately. She grabbed the serving spoon and threw a big pile of it onto my plate nearly covering my entire mound of rice. Oh great. Now what do I do? I had just learned about proper Thai eating etiquette in my Peace Corps training classes and the first thing they tell you is to eat everything on your plate. It is rude not to. I had done well to avoid the curry when it stayed in the bowl, but once it made its way onto my rice I was out of luck. I took a deep breath and scooped up a large pile of rice onto my spoon, smiled at my mae, and dipped the very edge of my spoon into the green pile. She nodded vigorously. “Gin, gin!” Eat, eat! I looked down at the spoon and grimaced. You signed up for this. I put the spoonful of rice and green in my mouth and slowly started chewing. It wasn’t terrible but I couldn’t really tell if I liked it because I couldn’t really taste the flavors. I’d only taken a tiny dip, remember? I took another spoonful of rice, smaller this time, and added a bit more green curry including an actual piece of meat – I think it was chicken (another thing I learned, never ask what protein you’re eating)? My mae preparing dinner in our home in Ban Heep. This time when I put the bite into my mouth I was completely sold. The flavor was indescribable at the time but now I can distinctly characterize it as a combination of sweet and salty with just the right amount of spice (even for me who, at the time, did not do anything spicy). The chicken was tender, the sauce was thinner than many curries with a bit more oil, but still creamy and savory and absolutely delicious. I smiled back at my mae and nodded my head that I did in fact like it. She grinned and continued to eat. I found green curry on the breakfast table every day for the next week. I tell that story because many people often have the same experience with Thai food, or any ethnic/exotic food for that matter. They find one or two dishes they like and stick to those because they are delicious but also because all the others are way out of their comfort zone. I’m here to tell you, feel free to eat whatever suits you but do not discount weird looking, smelling, or sounding dishes simply because they push your boundaries! Some of those dishes will end up being your favorites – I promise J . If the ones you decided to try are yummy, who is to say the other ones aren’t yummy too? Side note: When my mom reads this she is going to laugh hysterically … this little pep talk coming from her daughter who has always been the pickiest of eaters. Oh, the irony. 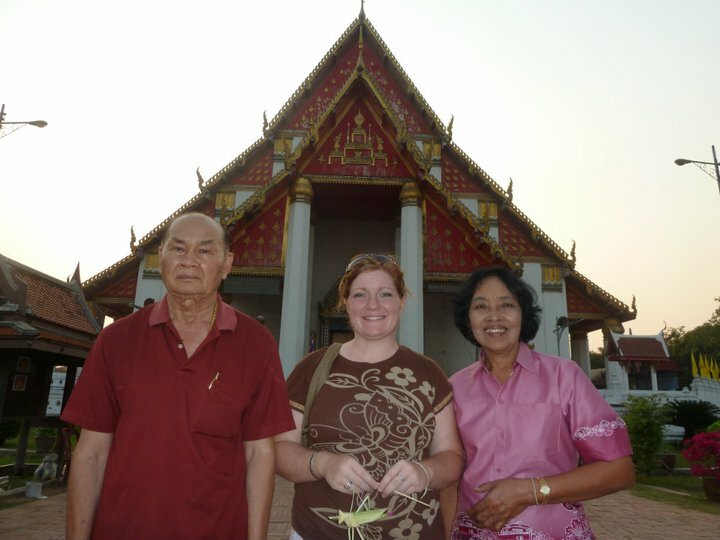 My paw and mae on a tour of the wats in Ayutthaya. Anyway, back to the gaeng kiao waan. If you’re a Thai food fan and you’re looking to branch out past the few dishes you usually try then this would be a great place to start. It doesn’t have too many crazy ingredients, it doesn’t have to be super spicy (though there is usually at least a little bit, which I’ll explain here in a minute), and it’s great with nearly all types of protein. Let’s call it a gateway dish if you will. Before I get to the recipe though, I want to clear a few things up with you regarding this particular dish. First, there is a misconception that green curry is sweeter than other curries when in fact, it isn’t. Yes, the word waan is in the name, which can be a little confusing (it means sweet in Thai) but it isn’t actually any sweeter than the other curries. By nature it is also the spiciest of all Thai curries because it is made from fresh chilies rather than dried ones. However, I will say that I can handle the higher spice in this dish better than other curries but that might just be a personal thing. If you don’t like spicy foods, you can always use less green curry paste (though you may lose some of the vibrancy of flavor) or you can make your own paste with less spicy chilies (no, making chili paste isn’t super difficult!). A bowl of traditional Thai green curry served with Thai eggplant and eggplant peas. Green curry in Thailand is much thinner and slightly less creamy. The ratio between the amount of broth and the amount of protein/vegetables is much larger. Most bowls of green curry I received in Thailand were heavily broth-based with some meat and veggies swimming around. 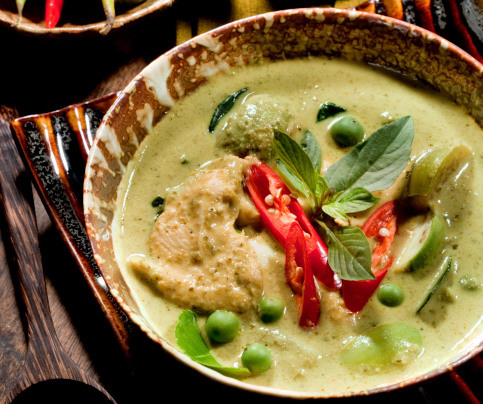 In the states, green curry (as with most curries) are served a bit thicker with a lesser amount of sauce. You will either receive a plate with both rice and green curry on it or you’ll still receive a bowl/plate of the curry but it will be protein/veggie heavy with just enough sauce to compliment the dish. This isn’t to say the curries here aren’t delicious, they just aren’t the same consistency or ratios. The vegetables that are used in authentic green curry are very different. In Thailand, the only vegetables you usually find in green curry are Thai eggplants and eggplant peas. It may also be topped with Thai basil. In the states, they add numerous other vegetables like bamboo shoots, bell peppers, and regular eggplant. I’ll admit, I’m not the biggest fan of Thai eggplants so the Americanized version with different veggies often appeals to me, but when I’m going for a traditional bowl of green curry I’ll always use the Thai eggplants. So I think that’s about it. Willing to try it yet? If not, I’d be happy to continue rambling about how amazing it is and regale you with more stories of my gaeng kiao waan experiences in Thailand. I have another particularly good one that involves a little restaurant across the street from MBK mall in Bangkok. Probably the best bowl of green curry in my life. I can’t wait to go back. To prepare your paste, cook 1 cup of coconut cream over medium-high heat. After a few minutes, you’ll begin to see a layer of film begin to form and your cream will start to break (the cream and the oil will begin to separate). You can also use coconut milk. If you do, add a TBSP or so of coconut oil as well as many milks will not break appropriately. Lower the heat to medium and add your curry paste to the coconut cream. Stir-fry your paste for 2-3 minutes. If it gets too dry, continue to add a tablespoon or two of coconut cream to the pot. This will stop the paste from burning. Once the cream has broken a little more and the color of the paste looks rich, add your chicken. Stir-fry the chicken until the outside has been seared and all pieces are coated with the paste mixture, approximately 1-2 minutes. At this point you can either continue in your wok or transfer to a large pot. Add the remainder of your coconut cream and your vegetables. If you are using multiple vegetables, only add the ones that need a longer amount of time to cook. Save the quick-cooking vegetables for the end. Add a bit of water to your mixture depending on your preferred consistency. Start with a small amount and add more as needed (I typically add about 1 cup of water). Allow your mixture to boil for a minute or two. Season with fish sauce and sugar to taste. Add second set of vegetables if you have them. This should include quick-cooking vegetables . Allow to cook until tender. Remove curry from the heat and top with Thai basil leaves. Serve this curry in a bowl separate from your rice. Enjoy! ← Summer Thai Cooking Classes … are we crazy! ?